Whether or not you are familiar with the file format FLV (Flash Video), you have probably used it before.. especially if you've ever watched a video on popular sharing sites. With that said, this program is specially designed to play FLV files. 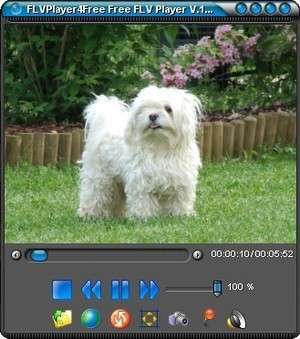 While this program has little in the way of features, it does support basic playback of many types of video files including FLV and WebM. Version 8.1.0.0 is a freeware program which does not have restrictions and it's free so it doesn't cost anything. For security reasons, you should also check out the FLVPlayer4Free download at LO4D.com which includes virus and malware tests. Additional screenshots of this application download may be available, too. 3.2 out of 5 based on 31 ratings. FLVPlayer4Free has a presence on social networks.